I exercise every day. Not because I like it. I could probably think of at least 100 other things I’d rather do than exercise. I don’t like to sweat. I don’t like how I look in workout clothes. I don’t like watching all the “I’ve had three babies and I’m thinner than I was in high school” ladies bounce on the elliptical. I get myself to the gym every day because I like to eat. And, no matter if I workout or not, I will eat. A lot. So, by getting an hour of cardio in each day I’m able to feel (a little) less guilty about what goes into my mouth. Since Jordan started first grade, a few of the other moms have been walking after drop-off. I decided to take a day off from the gym and walk with them. I was a little worried, because when I walk on weekends it’s not the same workout I get at the gym. I was worried I’d spend an hour walking and then have to go home and do more. Our first walk was about 3.7 miles. With hills. The walk was good, the conversation better. Female companionship is like a drug, let me tell you. Last Friday I walked with them for the second time. We walked over five miles. With hills. Almost two hours of exercise outside in the fresh air with friends. Did I mention it was over five miles? That little ditty, with the addition of the kickboxing class I had taken the day before, has made it so I could barely walk on Saturday. So yeah, I think I got a good workout. You know what happens after you walk for two hours? You get hungry. 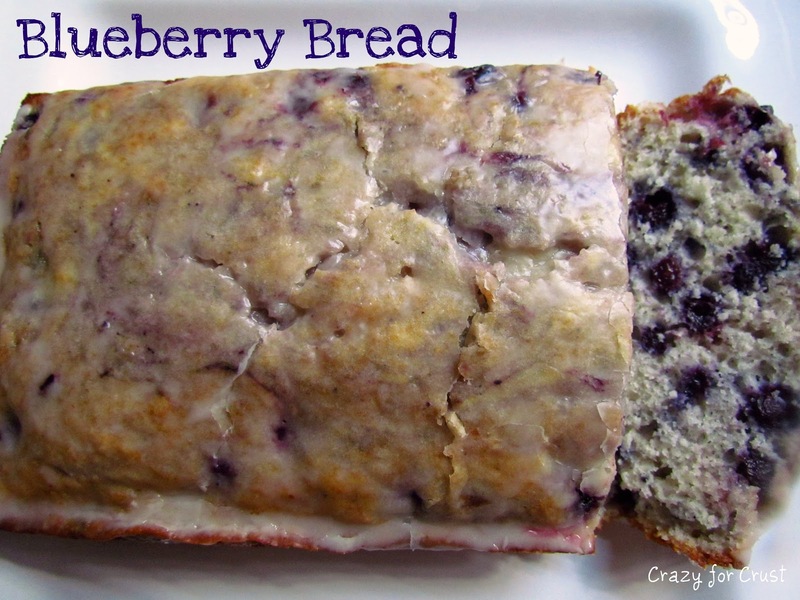 This blueberry bread is a perfect snack after a workout. I know, I know. The experts say “have some milk, yogurt, fruit” after a workout. Blah blah blah. What you need when you’re that hungry is substance. And this bread fits the bill. Plus it is fruit. Duh. It has blueberries in it. 1. Preheat oven to 350°. Grease a loaf pan with butter or nonstick cooking spray. 2. Whisk flour, baking powder, sugar, and salt in a large bowl. Set aside. 3. Whisk eggs and milk in a medium bowl. Stir in oil and lemon juice. Add wet ingredients to dry, stirring just until moist. Fold in the lemon zest and blueberries. Pour into pan. 4. Bake about 40-50 minutes until a toothpick inserted in center comes out clean. Cool completely. 5. To make glaze: Whisk ½ cup powdered sugar, 1 tablespoon lemon juice, and ¼ teaspoon vanilla in a medium bowl. Pour over cooled blueberry loaf and let dry before slicing. A very healthy and tasty blueberry loaf. Just read today that blueberries are good for heart and blood circulation. I love how PACKED with blueberries this is! YUM! Mhmm, I love Blueberry Muffins so I think I’ll love this loaf. That’s like one giant blueberry muffin. I’d say you definitely earned yourself at least two pieces. This looks delicious!! 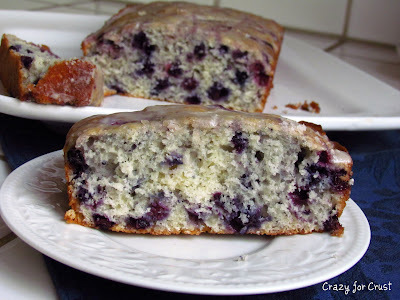 I love quick breads and am always looking for new recipes to try. Ps loved the story that you wrote before the recipe! Wow my husband was looking over my shoulder and said, yes…you need to make THAT (coming from a blueberry LOVER 🙂 Thanks for sharing. Delicious. My husband and son are also going to want this blueberry bread. It will be a great pre-exercise carb load for our son. His coaches have him on protein shakes for after workouts. I voted for you again. 🙂 Thank you for sharing this recipe with me at Joy of Desserts. You’re doing some intense walking. That’s wonderful. I’ll bet it’s much more fun than a gym, especially with the companionship. Have a great weekend. This bread looks delicious! I hate working out! But this is yet another reason why I need to…so I can eat all these yummy goodies.